Sub miniature screw-on connector, operating in the range DC-18 GHz. SMA was originally designed in 1958 and standardized years later under IEC 60169-1. It is the most popular coaxial RF/microwave connector. Stainless steel models are dedicated for high durability and MIL/aero applications, while brass version SMA-COM is reserved for commercial and telecom applications. 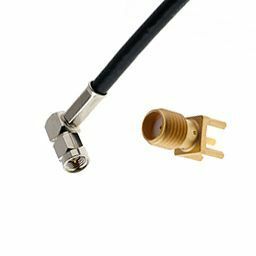 The range includes some SMA connectors specified up to 27 GHz. Hemeticity : leakage rate below 10-8 atm/cm3/sec on specific glass bead products.